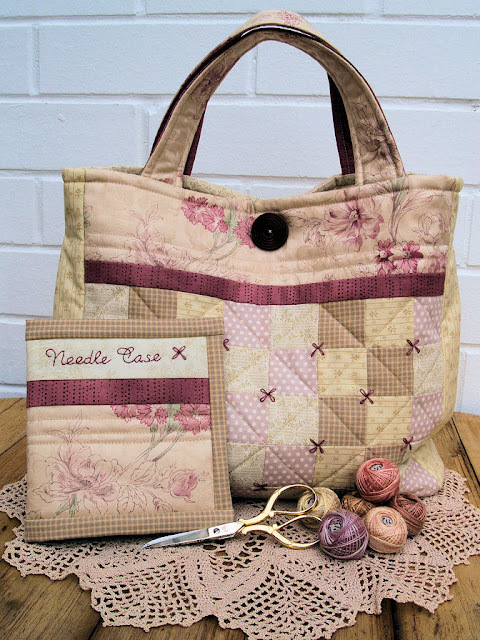 Do you need a beautiful sewing bag and needle case set? A few years back after examining my piles of projects, I vowed "to not begin a new project unless the one at hand was finished". This was my personal rule to live by. Naturally this rule did not last long because I like to dabble in so many different areas. When the weather turned cool I turned to knitting, crochet and hand quilting. In the warmer months I turned to sewing and hand embroidery. It's just the way I am which means the rule had to be modified to read " I can only have one project in each area at any given time". Years down the track, I am pleased to report that this has worked for me. At times the sticking to the rule has pushed me to finish a lagging project, just so that I can begin the new one I have fallen in love with. In keeping with this new agreement I have found the need for lots of bags. That way my half finished project, the pattern and supplies are all together ready for me when I want to grab them and resume where I left off. This is also the case when taking my project to a sewing circle. Sadly we do not meet regularly any more...but when we do, my bag of goodies is ready to go! With this in mind, I hope that you like this new sewing bag and needle case pattern that I have just added to the Stitching Cow website. This sewing bag is made up of simply patchwork which has been crosshatched quilted and then embellished with a small amount of hand embroidery.The co coordinating needle case is the perfect addition.The pattern for this design is available as an e-pattern or paper pattern, whichever you prefer. Perhaps this sewing bag is just the home for your latest sewing project! Let me know how many projects you have in progress at the moment, just so that I can feel a little bit more normal about my situation. I love this, it's very sweet. I try not to count them. =) I stay up on things I'm accountable for in a group ... most of the time. There's no hard and fast rule, though, sadly. Love the needlecase. I don't ever sew bags, because I hate purses and usually find one I can live with and then I live with it until it falls apart. I carry projects in tins, often Whitman's. But needlecases are a whole 'nother ball game! I know I should never admit to my works in progress! BUT I did count them last Sept. I quit counting after 80. The good news is that I felt so guilty that I finished 20 in the next 2 months. Then Christmas happened and of course many more new ideas. I love bags and have made quite a few. Yours are beautiful! 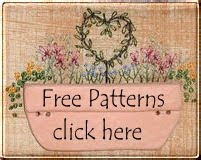 Love your new patterns Lenna! And I have way too many projects to count, but I do finish some along the way! Always good to have lots in progress, lol! Thanks and keep creating!